In a perfect world, no one would ever need to pen a resignation letter. People would find the ideal career immediately after graduating and be happy in that field for decades thereafter. Our world is not perfect, however, and in these times of economic uncertainty, there are many reasons workers might consider ending a partnership with their current employer. While more people than ever before are facing this prospect in the hope of securing a more favorable opportunity elsewhere, though, most people are stumped as to the phrasing of their resignation letter. That is where a good letter of resignation template can help. A free template like the one downloadable from this page can make this particular letter-drafting task easier to face. 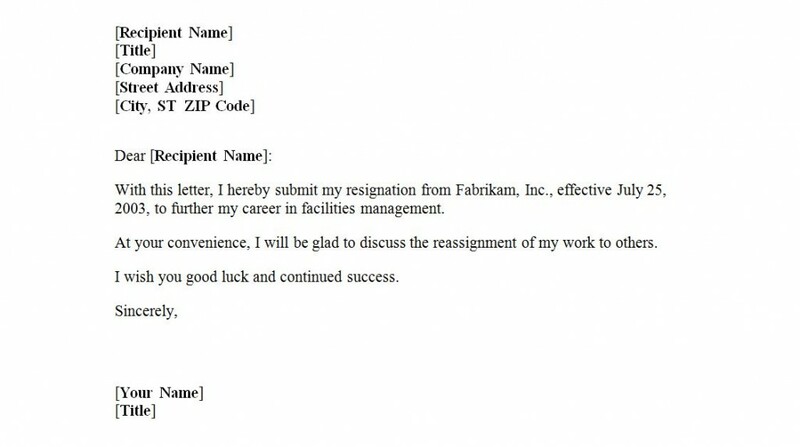 This specific letter of resignation template works with Microsoft Office. Our letter of resignation template is easy-to-use and fully customizable, with fields for relevant information such as your name, job title, and address, and the same information for the company receiving your letter. Just click the link to start your free download and save the file to a convenient place on your computer’s desktop. Keep your resignation letter brief. This letter is not the place to go into the full details of why you need to leave the company, and especially not the place to spell out any dissatisfaction you may feel. Use the letter to provide a simple and clean notification that your time with this company has come to a close; exit interviews are the correct time and place for all other details. After you complete your resignation letter, be sure to remove any elements of the customizable letter of resignation template that do not specifically relate to your personal situation. Print out three copies of the finished letter. Give one copy to your immediate supervisor, send the second copy via postal mail to the Human Resources department of the company you are leaving, and archive the third copy with your other important documents.